I grew up hiking, backpacking, and cross country skiing in the Northeast including New York, New Hampshire and Maine. I have been hiking for about 18 years and have been backpacking for about 10 years. I have lived at the Grand Canyon and I now live in Yellowstone. In all these experiences, I have slept on a tarp and in a tent, worn hightop boots and lightweight shoes, carried an external-frame pack and an ultralight internal-frame pack. Most of my hikes are about 8 to 15 miles (12-24 km). I am not fanatical about light weight gear, but I am starting to be more mindful. 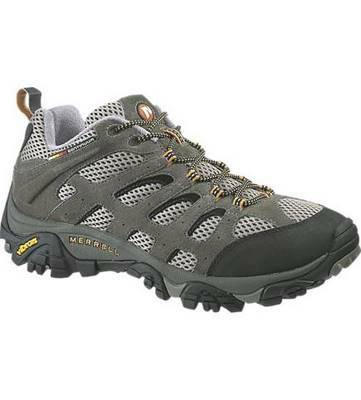 The Merrell Moab Ventilator is a low cut light weight hiking shoe. The majority of the shoe is leather and mesh making it very breathable and light weight. The back half of the outside of the shoe is leather and rubber. The sole comes up about an inch and a half which is met by a piece of rubber meant to protect the shoe from rocks and tree roots. The front half of the shoe is split between leather and mesh in alternating strips of material. There is another strip of rubber, similar to the one in the back, that covers the toe area which is meant to protect the shoe from rocks, tree roots, and other common hazards. There is a good amount of padding along the tops of the shoes that hug the ankle including the tongue. On the back of the shoe, there is a loop of nylon for pulling the shoe both on and off of the foot. The shoe has four nylon eyelets and two plastic eyelets at the top on each side of the tongue for lacing the round laces through the shoe. In addition, there is a piece of nylon attached to the tongue for lacing through to prevent the tongue from slipping down. The shoes have Vibram soles. The three pairs of Ventilator's that I have owned have all been tan, but they are now offered in an array of colors. Depending on shoe sizes I generally wear a 12.5 to a 13. Every pair of Ventilators I have owned have been a size 13 and have fit perfectly. From this, I have deduced that they run true to size or possibly slightly larger. Also, I have a high arch, and I have been able to use to foot bed provided without any problems. 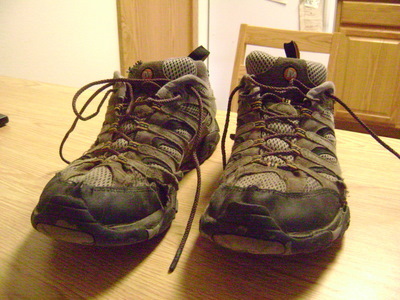 I bought my first pair of Moab Ventilators for a three month trip to Scotland in the summer of 2007. I was looking for a light weight shoe that I would be able to wear both on the trail and walking around town. The Ventilator seemed like a good choice. As it turned out, it was a terrible choice for the rainy climate of northern Scotland. Just as the name 'Ventilator' suggests, this shoe is meant to breathe and keep the users feet cool. This was my own fault, and I certainly paid the price as my feet were drenched by the end of every hike. Despite this downfall, which was largely my fault, I found that I thoroughly enjoyed many other features of the shoe. I found that they required practically no break in time and that my foot felt comfortable almost immediately. I took the shoe on many long and difficult day hikes, one of which was Ben Nevis, which is the tallest mountain on Great Britain at 4,409 feet (1,344 m). The trail, which ascended the backside of the mountain, proved to have some off trail sections that were very steep followed by a knife edge walk across a bolder scree field. The shoe proved to perform very well on the steep off trail and bolder sections. The shoes gave my feet and ankles the support they needed, and they gripped the rocks quite well. After the three months of use, in which I wore the shoes almost every day in addition to the hikes I took them on, the shoes were still comfortable and very well intact. While I was hiking, I would usually wear thick styled hiking crew socks. While I was wearing them around town or for short walks, I would usually wear thinner running socks. I have narrow feet, and I found that I was able to wear the shoe comfortably with either type of sock. In the summer of 2008, my Ventilators and I moved to the Grand Canyon. Over the next six months, I wore my Ventilators on every hike in the Grand Canyon ranging from three miles (5 km) to twenty miles (32 km) while carrying a pack from 10 pounds (4.5 kg) to 40 pounds (18.1 kg) with as much elevation change as 4500 feet (1370 m). I went on serious day hikes or backpacking trips two to three times a month. Many of the hikes were off trail or on unmaintained trails. The dry arid climate of Arizona proved to be much more suitable to the Ventilators. The high level of breathability of the shoe became a much valued feature. During this time period I thoroughly put this shoe to the test, and time and time again, it passed. The Vibram soles gripped as well as any shoe I have ever owned. I can specifically recall a moment on the Upper Miner's Route, which connects the Tonto Trail to the South Kaibab Trail on a narrow coulouir that looks just as bad as it is. At one point on this route, I had the specific thought of 'there is no way my shoe will grip this rock with the amount of weight I'm putting on it', but sure enough, it held. I have never had a problem with the gripping capability of the shoes. Throughout the six months that I wore these shoes in the canyon and the surrounding areas, I put hundreds of miles on them. Through cactus fields and scree slopes, the Ventilator held up very well. Even though it is a low-cut shoe and I was often on uneven surfaces, I never experienced any problems with the amount of ankle support provided by the shoe. In my opinion, and it could just be my perception, the Ventilator has a very wide base which helps in its ability to properly support its user. When they finally began to wear out at the end of six months, I ordered a new pair because I liked them so much. My new pair arrived just after I finished my last hike in the canyon as I was about to move. Even up until my last hike, during which the shoe almost completely fell apart, my first pair of Ventilators were comfortable and performed just as well as they had when I bought them a year and a half earlier. However, over the last three months of use, the shoes began to wear noticeably. Some of the strips of leather on the front of the shoe became loose and the stitching around the rubber on the toe came undone. Despite these minor cosmetic problems, my first pair of Ventilators continued to perform well up until I threw them out. I returned for a three day backpacking trip in the Grand Canyon the following spring with my second pair of Moab Ventilators. 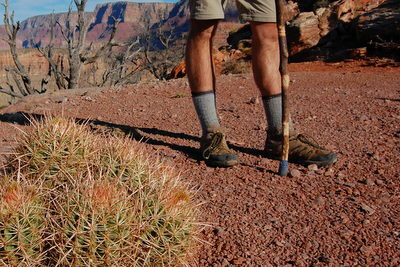 In my experience, trails in the Grand Canyon are tougher on shoes and feet than any other. They are filled with rocks, cactus, agave, awkward slopes, and other features that make it hard for a hiker to walk freely. On this trip, the front rubber toe piece developed a crack which grew throughout the trip. I had not worn this pair very many times before this trip, so this flaw was definitely disappointing. Despite this defect, this second pair fit as comfortably and provided my foot with just as much support as my first pair. However, because of the quick cracking of the rubber toe piece, I returned them. Although I found the second pair's quick destruction disconcerting, I quickly ordered a new pair. Just as my first two pairs did, my third pair broke in very quickly and were immediately comfortable. From May of 2009 until the end of August I put about 250 hiking miles on these shoes which does not include any miles I put on them while not hiking. By the end of the summer, there was noticeable wear on them. Some of the wear came from me sticking them slightly too close to a camp fire one night in an attempt to dry them. On one side of the shoe, the rubber on the sole compressed in the way that shrink wrap would. Also, there was a small spot where the fire burned through the mesh on top of the tongue. Still, they continued to perform well and provide my foot with the stability, support and comfort that I had appreciated from my first pair. I retired them at the end of the summer, but I still wear them for work and while riding my bike. As of writing this report, many of the leather strips have come undone around the sides, the sticthing around the toe rubber piece is coming loose, and the tread is worn down. Despite these signs of wear, the shoes are just as comfortable as they were when they were new. When I bought my first pair, I was worried about them wearing out quickly. My first pair lasted about a year and a half of very strenuous hiking, which was a lot longer than expected. My second pair lasted a painfully short stretch of a few months (many of which were non-hiking months). My last pair has lasted just about a year, which I am pleased with. Although I could still hike in them, I only wear them in casual situations now, but still enjoy their comfort. With every pair of Ventilator's I've owned, the shoes have long outlasted the shoelaces provided. The shoe laces provided were always the right length and worked sufficiently. Because I have a narrow foot, I have to tie my laces especially tight to get the desired snugness in the shoe. I attribute this to why I go through shoe laces rather quickly. On my current pair of Ventilators, I am on my third pair of laces. Overall, I am a very big fan of the Merrell Moab Ventilators. I feel great about them and would recommend them to almost anyone. For a light weight hiking shoe, as opposed to a boot, I have been very pleased with how they have performed. Previous to owning the Ventilator, I had owned full grained leather, high top hiking boots, and I have found that I can do just as many miles, on just as hard terrain in the Ventilators as I could in the boots. They grip well and provide my foot with good stability on uneven surfaces. With the extreme temperatures of the Grand Canyon, the high breath-ability of the shoe was much welcomed. The Vibram soles have provided me great gripping on a wide variety of rock and stone surfaces that has not been equaled in my experience and even though the tread has worn down over time, the ability of the shoe to grip to rock has remained strong. They are comfortable and required almost no break-in time, which I very much appreciate. Every pair, except for the second which may have been a manufacturer's defect, has proven to be quite durable. My first and third pairs have each lasted at least a year and have given me hundreds of hiking miles.